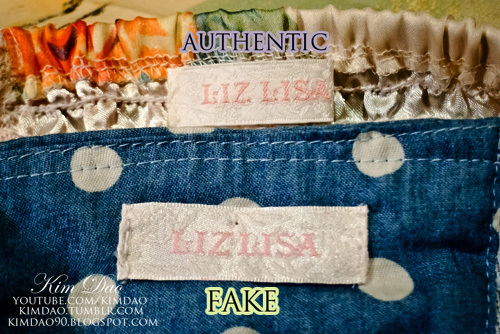 As promised today I'll be posting comparisons for real and fake Liz Lisa labels. Before I start I just want to say, the ONLY ways to buy authentic Liz Lisa clothing is through the official Liz Lisa site by using Tenso, or through the Liz Lisa Rakuten site. 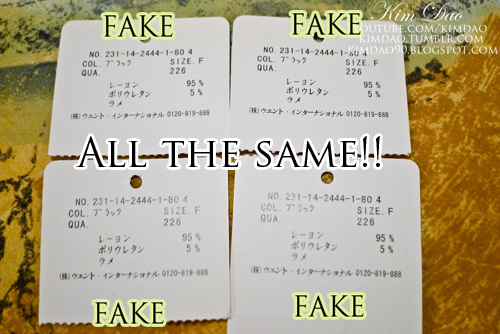 I have noticed recently, MANY new sites have been opening up, claiming they get their Liz Lisa clothes from the original factories, that's why they can sell them cheaper and sometimes labels are cut off. That is all a load of bull, DO NOT believe any of them. 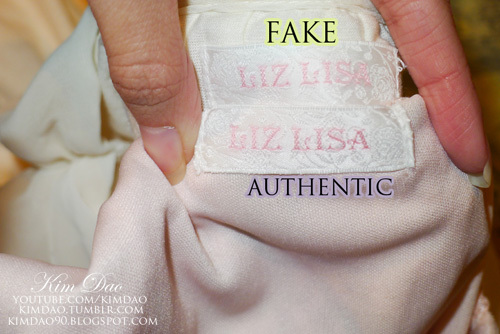 They DO NOT get their clothes from the original Liz Lisa factory, they get them all from Taobao. 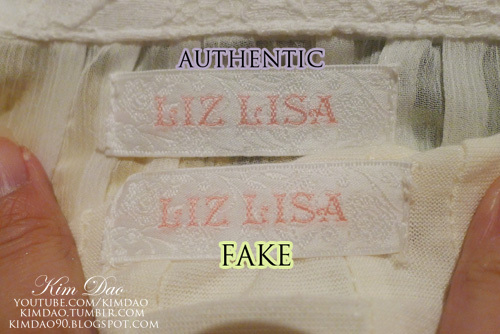 Taobao sells heaps of fake Liz Lisa clothing, and for a cheap price too! All of these sites just buy from Taobao, then they charge 3x the price they paid, major rip off. 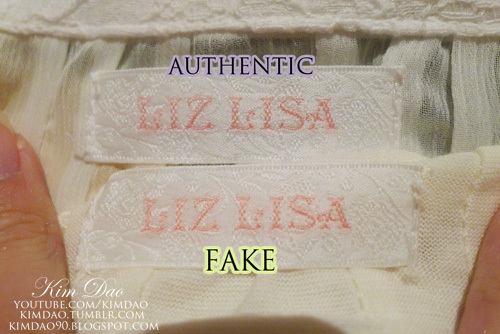 If you guys aren't sure whether or not a site (or someone) is selling authentic Liz Lisa and would want to know, just comment on this post and I'll try reply to it when I can. I have thrown away most of my Liz Lisa labels but fortunately I have kept one! The item was a huge coat I bought for half price cos it was on special lol. 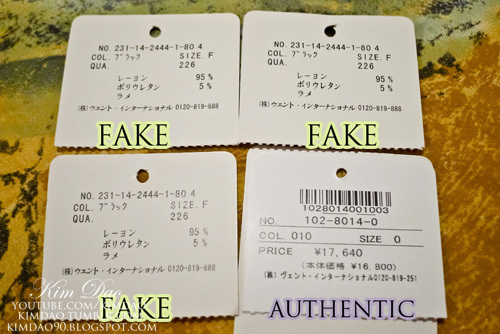 Anyway, when you buy Liz Lisa clothing the tag is bigger, however the sales assistant rips off half of it to keep for sales purposes I think. Sorry for the bad lighting, but as you can see, the real one is darker. See a difference in colour? The real one is darker than the fake ones. 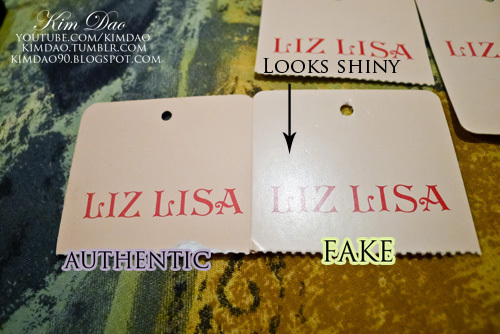 The REAL Liz Lisa label has a matte finish, the fake ones don't and will look shiny in light. Now, let's turn the tags around. The price is in Yen if you get it from Japan. Price at the top is with tax, price below that is without tax. The colour is a NUMBER. Size is a NUMBER. They are all the same! Colour says "ブラック" which reads "Burakku = Black". None of the items I bought were black. Size is F? The number is exactly the same for all the numbers. Fake one says "Liz & Lisa"
The fake one is made out of shiny material. Authentic one isn't. Now this last one is hard. It looks so real that I had a hard time comparing it to the real ones. 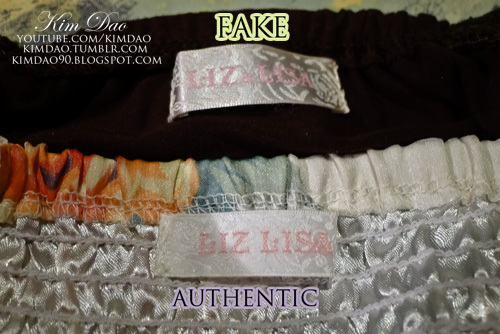 I used 3 different authentic Liz Lisa clothing to compare and finally found out the difference. So that's it for the comparison. Hope it helped you guys. Any questions just comment on this post and I will try get back to you! Wow, I'm starting to wonder if there is anywhere in the US that sells authentic Liz Lisa. 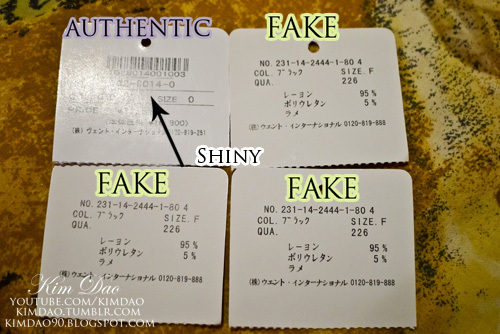 I didn't even think about that I might be buying fakes =[. I haven't bought from any of the stores you mentioned but I bought from others like cececat (aka mina kekoya or sugarfairyshop) and now i'm starting to wonder if its real! I also recently bought a dress without ANY tag. 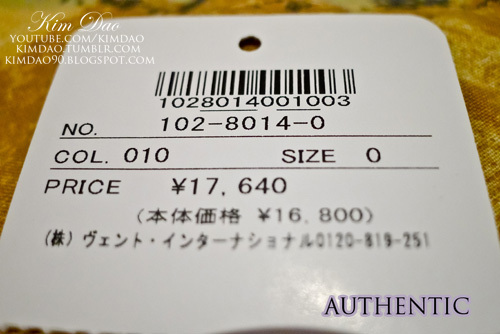 Like usually there will be at least the tag attached to the clothes, but there is none =[ plus it was SO EXPENSIVE! 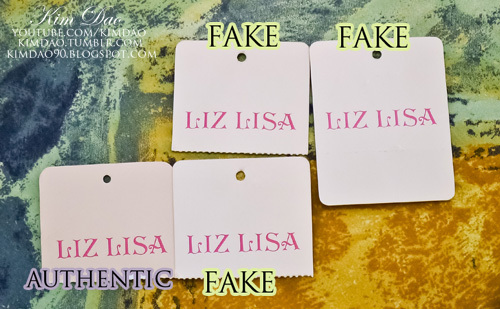 It is a reputable shop considering a lot of the other brands are real, but it makes me think when the supposedly liz lisa clothing didn't have any tags T^T! Have you heard of the shop MinkyShop.com? They have some LizLisa stuff, do you know if they are real? "No, they're not strictly from Japan at all (only a few items in store). Liz Lisa and Snidel items are manufactured in China and we arrange to get them directly from the factories there as surplus or ex-factory stock. Occasionally they can be untagged, but there are no defects. Hope this helps! ^^"
Ah, I totally forgot about that! When I have some time I'll take some comparison photos of those! I got a question! 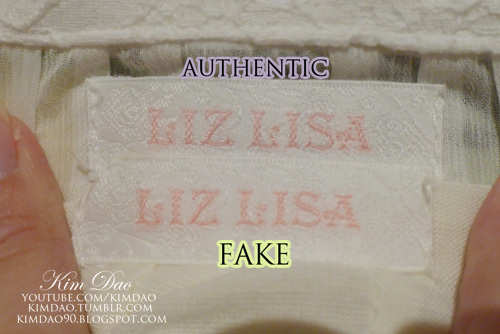 I've been to Japan and bought authentic Liz Lisa as well~ When they checked out my items, they tore off the bottom half of the tags along the perforated lines (just like your authentic ones only have half of the tag). 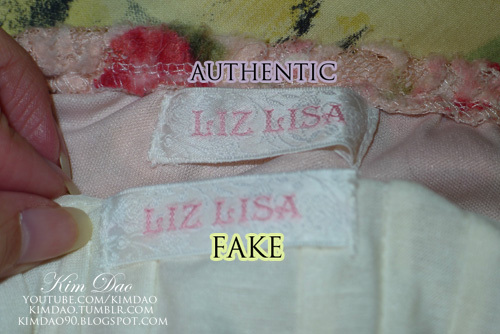 There is someone claiming to sell real Liz Lisa, and the tag looks real, just the bottom half is still there... Does that mean it's a fake? 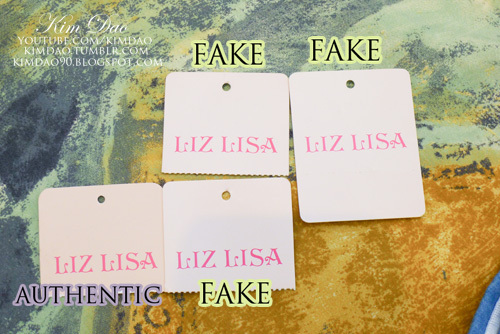 I'm wondering because I never ordered from Liz Lisa online, so maybe if we ordered online, they don't remove the second part of the tag? Oh I do buy from there! But one piece I bought looks like Liz Lisa except there's no tag >~< so I'm really unsure! 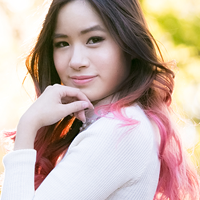 Could you show the inside tags of the blouse in your youtube video below? I have bought one of the same online, and not sure if it's authentic. 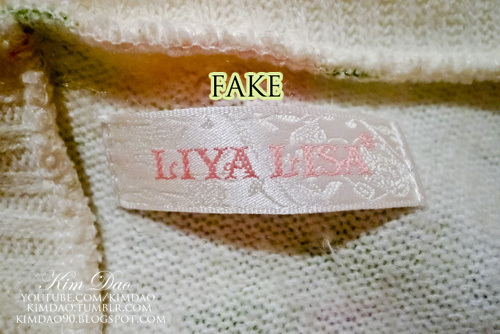 Yea Minkyshop is fake :( i ordered from there not too long ago and my liz lisa skirt said "Liya Lisa"
Even if they say that, the fact that they sold "Liya Lisa" items is a bit dodgy. The "Liya Lisa" items are all replicas of Liz Lisa items so I don't think it's a legit brand. The site just looks like a "wholesale-dress.net" website to me so doesn't look legit. I saw them advertise some skirts as Liz Lisa, so probably the skirts have the Liz Lisa label on them, but I'm 100% sure that Liz Lisa never made skirts using that material before. 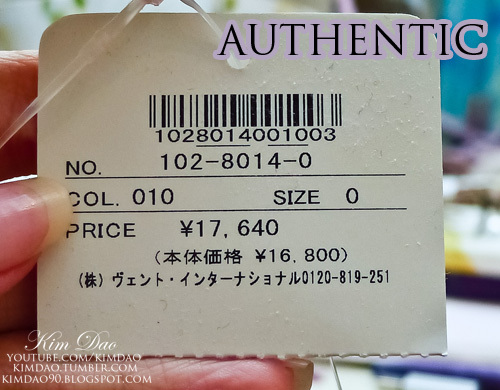 Usually when i bought Liz Lisa online, it doesn't come with the tag.. would you mind to post some pictures to comparison of the inside tag (the material tag)? Thanks a lot ! Thanks kim for posting this, I had bought a tote liz lisa bag on ebay that had just came in, not sure if I should return it to the sender, I was really worried that it would turn out fake. I had bought jimmy choo bags and Prada bags in the Philippines before so I thought I could tell if this tote was a fake but it was so hard untill I found your website. 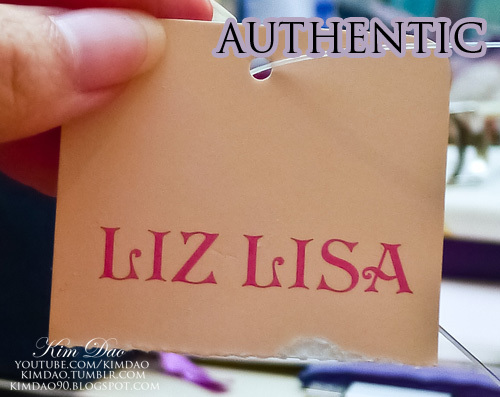 The tag on my liz Liza seems to look like the one you have but it's a pastel pink and the liz Liza word is a darker pink matte on the outside and a bit shinny in the inside. Thanks again kim! !